Come and join in with one of the activities that take place in your village hall. BADMINTON Equipment in the Hall to start a new group. A ’Start up’ discount offered to any organisation starting a new regular booking. Large enough for Badminton or four mats of Short Mat Bowls etc has a curtained stage with professional stage electrics. Kitchen equipped with two cookers and plenty of worktops. Toilets including disabled. It also has a small adjoining room suitable for use as a bar with it’s own exit door. 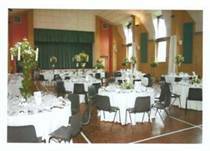 Hall suitable for up to 250 people for use as a party venue, dancing or theatrical use. Has it’s own separate entrance with disabled access and is a smaller room which is totally self contained with it’s own kitchenette and toilets including disabled. Licensed for 80 people or less sat at tables it is suitable for Conferences, Small Parties or meetings, Bridge or Computer classes. To make a Booking: Contact the Booking Secretary on: 01963 251217. Address: Village Hall, Springfield Road, Milborne Port.